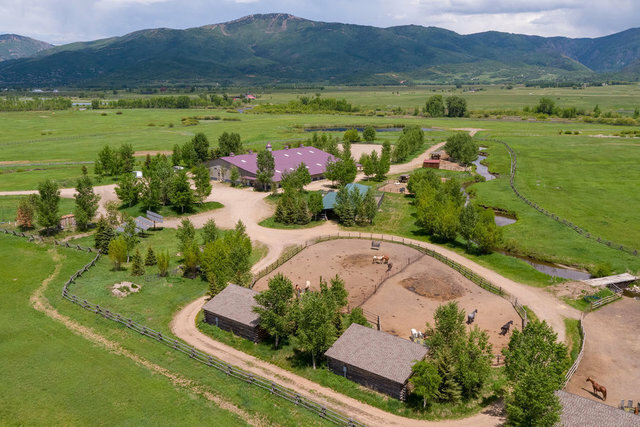 Located in the heart of the Yampa Valley and enjoying lush hay meadows and a pond with Oak Creek wandering through the landscaped property, Wandering Creek Ranch is an exceptional equestrian facility ideal for the avid horse enthusiast or entrepreneur who wants to continue to run the established horse boarding business. Remarkable improvements include a 125’ x 155’ Morton barn/arena, numerous loafing sheds, round pens, 245’ x 145’ outdoor arena, covered shelter with 14 stalls and several pastures and paddocks. The heated barn/indoor arena has 10 stalls (1 foaling), tack room, feed room, wash bay, workshop, office, lounge, hay storage and equipped with rubber flooring and auto waterers. The 51 acres without covenants offers the opportunity to build your dream home plus a detached caretaker unit. Views of the Steamboat Ski Area and surrounding mountains are spectacular and the close proximity to town (less than 10 minutes) elevates the appeal to just about perfect.